The thing about solar pool heating panel ratings is that they are done using “test conditions,” not real world conditions. While our panel option is very highly rated in terms of BTU output, what is more important is how the complete system works. Ratings tests are performed with a specific flow rate that is recommended by the manufacturer. No consideration is made for the existing pump and plumbing in a given pool system, with which all solar pool heating panels must integrate. If you can’t get the flow, you can’t meet the rating. Other test factors skew results like wind velocity and cloud cover. Manufacturers tend the highlight the conditions where their panel performs the best. That’s not real world performance. You cannot rely on test results alone, especially the cherry picked numbers in a marketing piece. Ratings give you a picture of “average” performance without consideration of when you are actually likely to use your pool. This is the brand we sell and install. Made in Florida, we believe it is the best product available in Southwest Florida for many reasons. The most important factors are the tube-on-web design, which provides maximum flexibility paired with excellent performance, low flow resistance, and durable construction with an over-molded header. 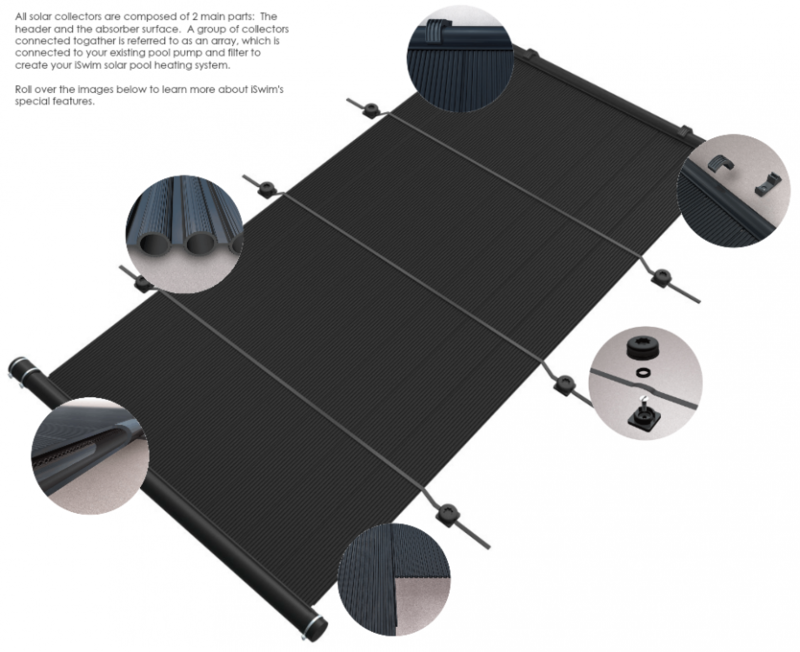 No other brand offers all of these features in a single solar collector. However, a solar pool heater is about the total system, not just the panel. We use all 2 inch plumbing and valves, which improves performance and/or reduces energy costs. You cannot review a solar panel based on its test rating or other quantitative measure without looking at the entire system. We would be delighted to go over all of the advantages of the iSwim product with you in your home, side by side with the competing brands. Also a tube-on-web design, this panel is suitable for all roofs, and is rated well under test conditions. Unfortunately, the relatively high flow resistance and smaller plumbing throughout the system reduces flow and/or increases energy costs. Throttling down 2 inch plumbing on most new and existing pools to 1-1/2″ is not ideal. BTU ratings are not worth much without considering the total system flow rate, which is hampered by panels and systems with more back pressure caused by restriction in the solar plumbing loop. Don’t fall victim to myths about flow balancing in systems with low resistance. The most common service issue with this panel brand tends to be panel body and header weld leaks. FAFCO offers both a full body welded tube design and a loose tube design. The full body design has good BTU ratings, but suffers from very high back pressure (low flow) relative to other designs. You can’t get the performance if you don’t have the flow! Leak issues associated with welded tubes and welded panel to header joints are prevalent. The loose tube model is a poor performer in cool and windy conditions – when you need solar pool heating most. Bubbles in the pool due to clogged filters is a constant issue because these panels are not resilient to pool systems with high operating pressures, and they require more pump speed (energy) for proper flow when using a variable speed pump. This is a loose tube design also. It performs great in the summer (when you don’t need it), and poorly relative to full body panel designs in the most challenging conditions. The loose tube design also tends to trap leaves and pine needles, which can be a problem if you are near a lot of trees. The manufacturer claims that the loose tube design is great for high winds and does not require straps, but that supposed advantage is also its downfall — individual tubes allow wind through the panel, reducing heating performance. This system does have an over-molded header design, but that flow advantage is destroyed by the use of smaller 1-1/2″ headers, plumbing and valves (usually cheap red-handled ball valves). O-ring leaks between panels tends to be a common service issue. When reviewing solar pool heating panels, consider the entire system. Panel ratings alone are not a good indicator of the results you can expect. There is no single measure of performance that you can consider. All solar panels will heat your pool. The questions is when and how much, and whether they will integrate well with your existing system. If you have a variable speed pump or plan to get one in the future, will it cost you more money to operate your pump at higher speeds? Is the controller you are purchasing compatible? Are you willing to sacrifice performance with smaller and cheaper plumbing and valves? All of the panels have essentially the same warranty (that’s a whole other discussion about puffery and myths about warranties). All panels will heat your pool to pretty much the same degree with all else being equal. However, all else is never equal. The best solution is to select the panel with the lowest restriction to flow and don’t skimp on the other important system components. Ask yourself what makes the most sense when it comes to all of the system components. Bigger is better. Size does matter. Note: Brands above may be trademarks of their respective brand owners or manufacturers. I appreciate the fact you’ve taken the time to honestly review your competition, as not many companies would do that. I believe since you’re so forthcoming with that information it makes you far more reliable and gives me the basis to conduct my own further research on solar panels should I wish to install them for any purpose. I didn’t think they could vary so much in terms of effectiveness, so it’s good to understand how and why that happens. Based on what you say and research I’ve done on my own, I do believe that the panels you provide seem to be at the top of the market. When looking into solar panel options, how does one go about actually choosing which is right for them? I know you said they all do the same thing but it is a matter of how well. We have a medium size built in pool, nothing HUGE but I would like it to be able to keep steady heat all year round since half of it is in the shade. Britanica: While every existing pool system is different, one thing is universal — more flow increases heating performance and/or reduces energy costs. That is why we use only 2″ plumbing and valves and the panels with the lowest flow restriction in the industry. Test ratings are useless unless you are comparing panels under identical conditions. That is not realistic in the field. Panels with higher restriction will not operate as close to their rating as panels with lower restriction. This was fascinating! You review were awesome! I appreciate the quality of this product. I have now more information to choose the right one. Yep, it’s definitely about the whole package. Some things will work better for certain conditions and certain people. Love how you compare the different panel options and not just try to push the most expensive one. That’s means your an honest company. These solar pool heaters are a great way to get comfortable water temps without having to spend an arm and a leg to get the heat.